The Cat Mountains original pastel is available framed. Prints are made in archival inks on Epson Velvet Art Paper, Cold Press Digital Giclee Paper or Artist Canvas. Three cats asleep, just like mountains in the dark. This was purely a visual inspiration, looking at Mimi and Bean and Mewsette all curled into one another, all the ears and backs and peaks and valleys looked like a mountain range to me, so I decided to do a more finished drawing with that idea. In order to make it convincing to anyone else but me, I had to put the moment into context. Where were these mountains? I thought. And what time of day was it? I decided because they were dark and the highlights were one of the very most inspiring things about them that it had to be night. 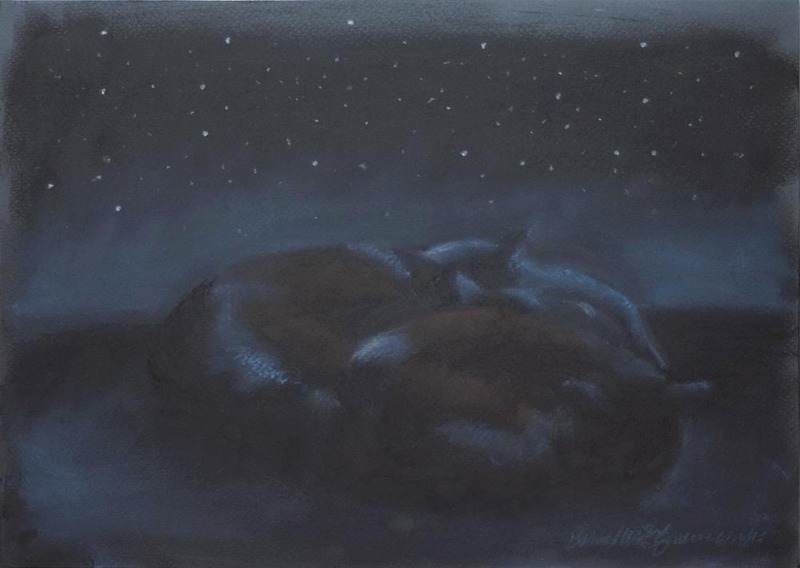 I added stars to the night sky after I’d let it sit for a while; I didn’t want to, it seemed cliché, but in the end it drew attention away from the cat figures long enough that they did, at first, look like mountains in the darkness. Where are they? Because they were actually sleeping on my nice flat and level work table, I decided they might be mountains near the desert. What I was trying to capture was the sense that they rose up organically from the surface, much as mountains in the desert seem to do, and convey both the strength of mountains and the quiet peace of a mountain scene at night under a starry sky. It’s not just an interesting visualization, it’s also descriptive of what I intuitively sense from cats themselves, and especially this particular group of five when they get together in cat piles, that quiet tranquility, yet the strength of their structure evident even as they rest. I’ve never seen mountains in the desert under a dark and starry sky. That part is pretty much made up from some photos probably in National Geographic and some creative visualization. They are worked in pastel on black pastello paper, though unlike other sketches I didn’t leave the black open, instead I drew in the darkest areas with black pastel and didn’t leave anything uncovered. I’d mentioned earlier that I typically ignore their color, using their silhouettes as a starting point for new designs, but this time their solid blackness is an important part of this idea, imparting the idea of solid strength. Their mahogany mid-highlights and their blue top highlights were part of the inspiration as well, seeming to describe the slopes and peaks of a mountain in starlight. I’m not sure I would have seen this visualization that led to this if they’d been striped or spotted. And while typically my daily sketches are quick and undetailed studies and a pretty literal interpretation of what I see, this is an example of some of the ideas I have on a regular basis, and which I’ll pursue in between other things. This entry was posted in animal-inspired merchandise, cat merchandise, feline artwork, pastel and tagged animal artwork, black, black cats, blue, cat art, cat artwork, cat merchandise, cat sketches, cats, feline artwork, pastel, three cats on July 8, 2016 by Bernadette.